The Cabot Oil and Gas Corp. is currently drilling exploratory wells in Ashland County. SALEM, Ohio — A Houston-based energy company with oil and gas drilling experience in Pennsylvania’s Marcellus shale is moving west — this time hoping to find oil or natural gas in north-central Ohio. The Cabot Oil and Gas Corp., which began its horizontal drilling program in 2008, is building exploratory wells in Ashland and Richland counties, with an interest in leasing land in surrounding counties. Cabot is drilling five wells that will explore formations below the Utica shale — approximately 6,000 feet deep. To do so, the company is seeking an amendment to existing leases with Columbia Gas Transmission — now part of TransCanada — to allow for horizontal drilling. George Stark, company spokesperson, said many area landowners hold leases with TransCanada, which allow for natural gas storage and vertical well drilling, but not horizontal wells. Cabot is offering landowners $25 an acre and 12.5 percent in royalties for whatever resource is extracted. Landowners who end up getting a well on their property — or incur other surface damage from the drilling activity — will receive additional compensation, Stark said. “Our geologists believe there is an opportunity to produce energy out of the Ashland-Richland area,” he said. The company is not sure what it will find — nor how much. “It’s still very much an exploration play for us,” said Stark. Another company, Devon Energy, had drilled wells in the area about six years ago, but the results were not favorable and the wells were plugged. Stark said Cabot studied area wells that failed, but believes that going deeper could prove productive. The prospect of leasing and drilling in north-central Ohio has brought many of the same concerns landowners first experienced in eastern Ohio, and in western Pennsylvania. Among the top concern for landowners: How much compensation is appropriate? The $25 an acre is significantly less than the $5,000-plus offered to landowners in eastern Ohio counties when the first wave of leases were signed 10 years ago. Royalty payments. If something is found, Stark said the 12.5 percent royalty will provide the most return to landowners — and he said the royalty is on par with what is paid in other states. Dale Arnold, energy policy expert with Ohio Farm Bureau Federation, said Cabot is not necessarily out of line with its offer. In addition to the play being unknown, he said oil and gas markets have also changed, with a significant decrease in oil prices since horizontal well drilling began. 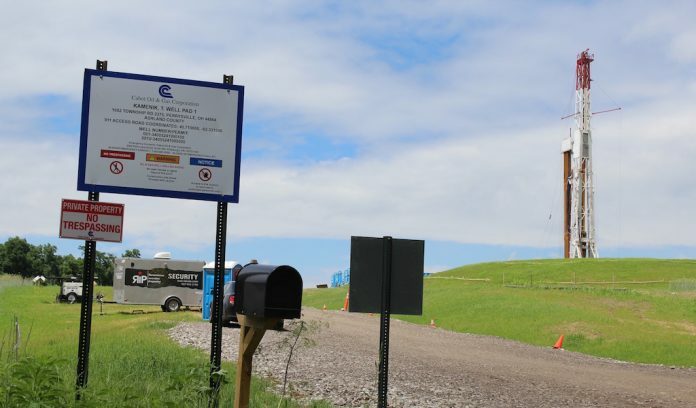 Chris White, an oil and gas attorney with the White Law Office, of Millersburg and Cadiz, Ohio, said the lease amount is a reflection of what is known so far, which is very little. Similar lease amounts were offered in eastern Ohio — before increasing dramatically — but it’s not clear this part of Ohio contains the same resources. ”It’s too early to know what’s going to happen with this,” White said. According to Arnold, the production results from the test wells will be a big indicator of what happens next. The results must be reported to the Ohio Department of Natural Resources, and if they are favorable, he expects lease offers to increase. But a sticking points, of sorts, is that much of the land is already leased to TransCanada — and depending on how those leases are interpreted, landowners may not have much choice. Some leases are over 100 years old, Arnold said, with the most recent amendments done in 1983. He said it’s been interpreted that with many of the leases, TransCanada has the right of first refusal with regard to natural gas exploration. White said in strict terms, it could be interpreted that TransCanada has the right to all minerals, no matter what depth or play. According to Stark, Cabot can proceed with vertical drilling, but TransCanada and Cabot need a landowner’s approval to allow horizontal drilling and to amend the leases. The prospect of drilling has ignited environmental concern among some landowners, who fear the drilling could lead to issues with the area’s water supply and increase industrial traffic on roadways. Ashland County residents George and Janet Ebenhoh, who live near Cabot’s first well in the area, in Green Township, said they are concerned about blind spots on the roadways and a lack of flaggers to direct traffic around roadside equipment. George Ebenhoh has voiced his concerns to county officials, trying to bring more attention to the issue. “If I didn’t do something to try to prevent a horrible accident from happening on that road, I wouldn’t be able to live with myself,” he said. The Ebenhohs are also concerned about the chemicals being used in the drilling process, and the use of local water to drill the well. Some landowner groups in the area have posted signs trying to stop the drilling, citing the same concerns. They include the Network for Oil and Gas Accountability And Protection, which fights “threats to health, safety and property rights,” that the group says stem from oil and gas drilling. Previous articleCan biocontrol nematodes combat corn rootworm? Oil prices maybe too low to be profitable.